Rashtriya Mahila Kosh (RMK) was established by the Government of India in March, 1993 as an autonomous body under the Ministry of Women & Child Development. It was registered under the Societies Registration Act 1860. 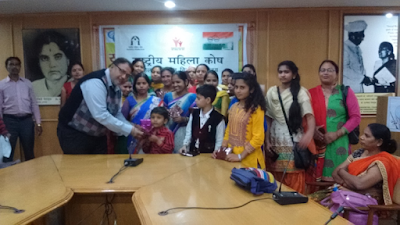 Rashtriya Mahila Kosh (RMK), established in 1993 is a national level organization as an autonomous body under the aegis of the Ministry of Women and Child Development, for socio-economic empowerment of women. The operating model currently followed by RMK is that of a facilitating agency wherein RMK provides loans to NGO-MFIs termed as Intermediary Organizations (IMO) which on-lend to Self Help Groups (SHGs) of women. RMK extends micro-credit to the women in the informal sector through a client friendly, without collateral and in a hassle-free manner for income generation activities. RMK has taken a number of promotional measures to popularize the concept of micro financing, enterprise development, thrift and credit, formation and strengthening of Women-SHGs through intermediary organizations. To promote or undertake activities for the promotion of or to provide credit as an instrument of socio- economic change and development through the provision of a package of financial and social development services for the development of women. To demonstrate and replicate participatory approaches in the organization of women’s groups for effective utilization of credit resources leading to self-reliance. To promote and support experiments in the voluntary and formal sector using innovative methodologies to reach poor women with credit and other social services. To sensitize existing government delivery mechanisms and increase the visibility of poor women as a vital and viable clientele with the conventional institutions. To promote research, study, documentation and analysis, including provision of fellowships and scholarships, of credit and its management and of successful experiences at various levels in order to promote replication and dissemination of successful credit extension and management methodologies. To promote the federation and net working of women’s organisations for shaping & exchange of experience and information and to develop skills in response management & social mobilization. To promote and support the expansion of entrepreneurship skills among women. To cooperate with and secure the cooperation of the Central Government, State Governments and UnionTerritory Administration, credit institutions, industrial and commercial organisations and non-governmental, voluntary and other organisations and bodies in promoting the objects of the Kosh. To do all such lawful acts & things as may be necessary or conducive for furthering the objects of the Kosh. 2. There shall be no discrimination on the ground of religion, community, caste or class, creed or race in carrying out the aims and objects of the Kosh. 3. All the incomes, earnings, movable, immovable properties of the Kosh shall be solely utilized and applied towards the promotion of its aims and objects only as set forth in the Memorandum of Association and no part of income and property of the Kosh shall be paid or transferred directly or indirectly by way of dividends, bonus, profits orin any manner whatsoever to the present or past Member of the Kosh or to any person claiming through any one or more of the present or past members. No member of the Kosh shall have any personal claim on any movable or immovable properties of the Kosh or make any profits, whatsoever by virtue of his membership. The accounts of the Kosh shall be audited and balanced each year. Provided, however, nothing herein contained shall prevent the payment, in good faith, of remuneration to any member or other person in return for any services rendered to the Kosh or for traveling allowances, halting or other similar charges. The Kosh discharges the following functions for the furtherance of its objects. The Kosh will seek to enable women to achieve economic independence. It will strive to go beyond credit delivery and provide services for integrated development centred around the needs of poor women. While provision of credit to cover composite needs is essential, such credit will be linked mainly to production and economic activity. To create an environment to facilitate and support further innovation and experimentation for designingsuitable delivery mechanisms to reach poor women. To provide for research, whose primary function would be to explore/facilitate and conduct participatory action research and analysis, based on which policy imperatives and action (including legislation) can beidentified and advocated to address the constraints in the formal system. Education of credit management will be integrated with the provision of credit, along with literacy and skill training for individual women, leadership training among groups for self management, etc. Accessibility of credit to poor women will be improved in terms of physical distance, simplification of procedures, flexibility of measures for loans and recovery and other measures conducive to increase utilization, etc. Provision of a number of support services (both economic as well as social) to enable the women to address themselves to the complexity of the problems and deprivations arising from poverty and powerlessnes, over the above services and schemes already existing. Provision of adequate, timely, regular flexible credit inputs matched to the individual needs of women allowing for the seasonality and diversity of poor women’s work and occupations. Promote and support grassroot level societies and organisations and other participatory structures for providing for women effective access to decision making. To have a policy and advocacy dimension in its working which based on all of the above, would provide a basis for revisions in the formal system. Develop effective channels of communication between women and the credit/banking systems to enable the latter to adapt their procedures as required by the personal priorities and constraints of poor women. Advocate for greater appreciation among the conventional credit systems of the need for simple alternative systems and rethinking of the social lending costs in reaching the poor. Establish a mechanism for dissemination of information and experience among agencies in the Government and non-government sectors in the area of credit for poor women. Identify and build up a resource base for training, project formulation and evaluation of needs at regional levels so as to promote greater outreach of services and coverage of remote areas. To mobilize resources at several level from governments, public and private donors and from other developmental agencies both governmental and non-governmental. To coordinate with other credit and development agencies/connected with the well being of women. To grant monetary and other assistance including loans/guarantees to banks/ persons/organisations and associations, etc. who are engaged in the promotion and development activities for economic upliftment of women. To subscribe to or become a member of or otherwise cooperate with other associations whose objects are wholly or in part similar to those of the Kosh. To borrow, raise or secure the payment of money in such manner as the Kosh shall deem proper or convenient for furtherance of the above objects and, in particular, by the issue of bonds, debentures, billsof exchange, promissory notes or other obligations or securities of the Kosh and to purchase, redeem or pay off such obligations or securities. To accept and to give grants, donations and subscriptions in furtherance of the objects of the Kosh. To purchase, accept as a gift or otherwise acquire and own or take on lease or hire temporarily or permanently, any movable or immovable property necessary or expedient for the furtherance of theobjects and activities of the Kosh and to deal with the same in any manner whatsoever. To support and do all such things as are or may be necessary or incidental to, or conducive to the attainment of any of or all of the objects of the Kosh. Rashtriya Mahila Kosh is being administered by a Governing Board of sixteen members consisting of the ex-officio Chairperson who is Minister in the Ministry of Women and Child Development, 7 Senior officials of Central and State Government, 7 Specialists and representatives of NGO’s active in the field of micro-credit for women, the Executive Director, Rashtriya Mahila Kosh who is also ex-officio Member Secretary. Permanent Members : Sponsors shall be the permanent members of the Kosh. All members of Governing Board. Institutional Members : Institutional Members could be Financial Institutions, Banks/Corporate Bodies, Public Charitable Trusts, Benevolent Societies, Academic Bodies, Research Institutions, Institutes or Bodies organised or setup by the Central Government or any State Government or other agencies for the purpose of promotion of economic upliftment of women (with particular reference to thrift and credit or otherwise),provided that each of them satisfies the conditions and has made a minimum contribution or such amount as may be prescribed from time to time by the Governing Board. Individual Members : These could be from experts in related spheres, individual beneficiaries, or theirGroups/Federations on payment of the contribution and compliance with such conditions as may beprescribed by the Governing Board.